December 9, 2014 Robert A. Weigand, Ph.D. 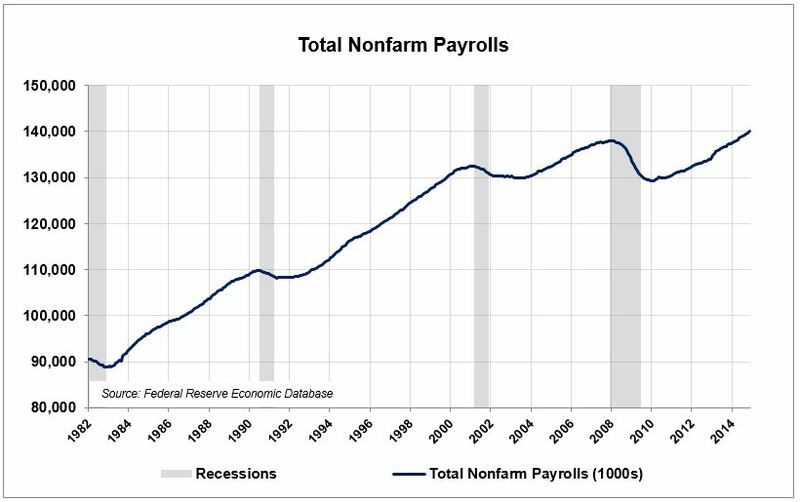 This post contains Part 2 of my 3-part Economic Outlook for 2015 (read part 1 here). In this article we’ll examine The Conference Board’s 4 Coincident Economic Indicators, which measure the strength of current economic activity. My rankings for each indicator are shown below (-1, 0 or +1), along with the equally-weighted and Conference Board-weighted scores of +50% and +67%, respectively (based on a scale ranging from -100% to +100%). The coincident indicators show that the U.S. economy is currently strong and gaining momentum heading into the turn of the year. 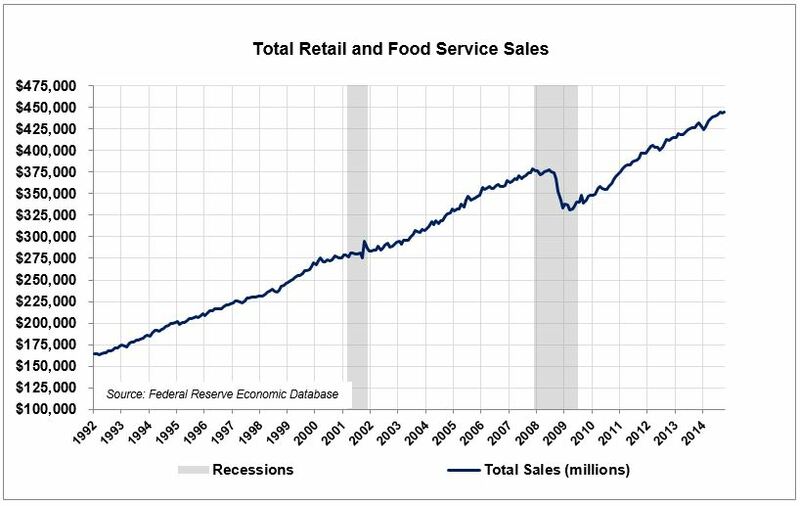 The first coincident indicator is Retail and Food Service Sales, heavily weighted at 53.2% (this is a substitution for The Conference Board’s Manufacturing and Trade Sales indicator). Total sales have risen steadily since the last recession, earning this indicator a score of +1. S&P’s Capital IQ reported that in the period ending with Q3-2014, sales grew at an annual rate of 2.9% and EPS increased a red-hot 9.2%. The second coincident indicator is Total Nonfarm Payrolls (weight = 25.9%). 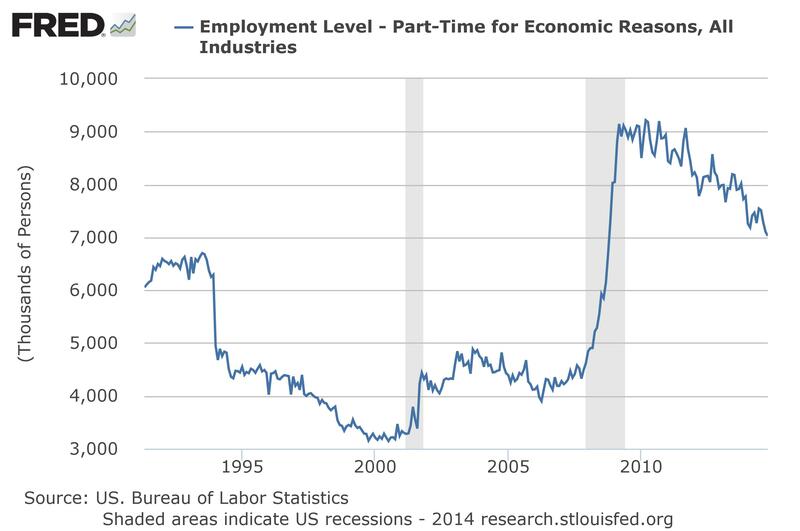 The U.S. economy is producing new jobs, with total employment finally exceeding its level from the mid-2000s. The series is clearly in a long-term uptrend. An unusually low level of voluntary terminations accounts for the slower pace of new hiring. 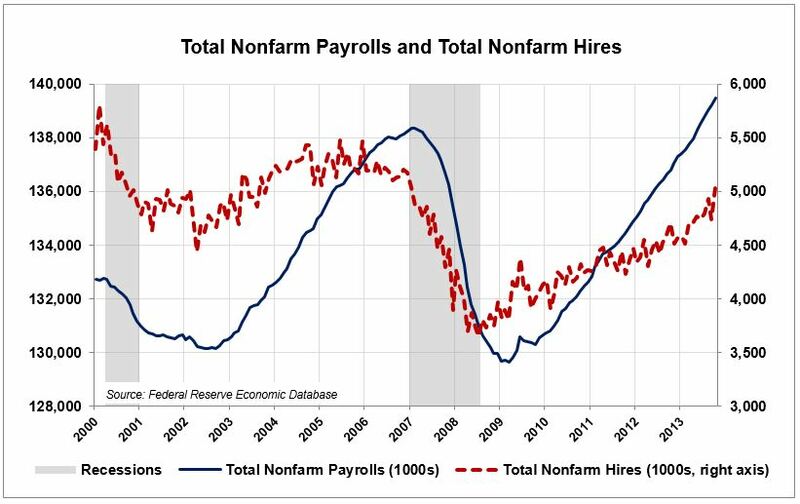 I will therefore rate the Total Nonfarm Payrolls indicator zero — the uptrend is positive, but the mix of full- and part-time jobs being created and the sluggish rate of new hiring tempers my enthusiasm. 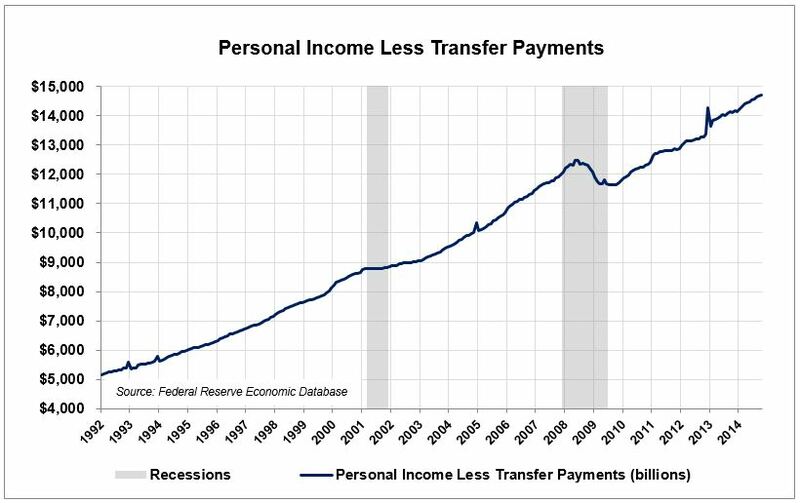 The third coincident indicator is Personal Income Less Transfer Payments (weight = 13.6%). Personal income in the U.S. is at an all-time high, which is definitely a positive. Examining the next graph below, however . . .
. . . I compare Personal Income to Transfer Payments and Personal Consumption Expenditures. 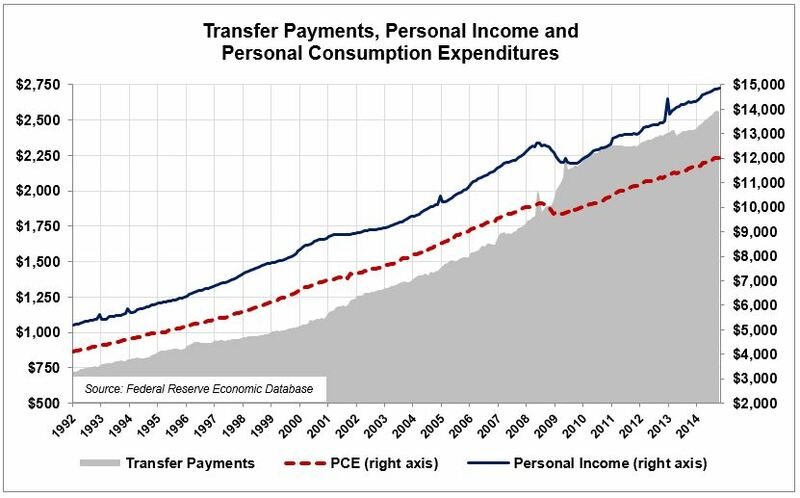 Notice how the upward trend in income and spending is strongly supported by an above-trend surge in Transfer Payments. (Large and growing transfer payments are one of the primary reasons the U.S. owes the rest of the world $18 trillion.) Although I have strong concerns that future reductions in Transfer Payments will be fiscally necessary, and the accompanying effect on spending will be unpleasant, I’ll rate this indicator a cautious +1 for now. The fourth coincident indicator is The Index of Industrial Production (weight = 7.3%). 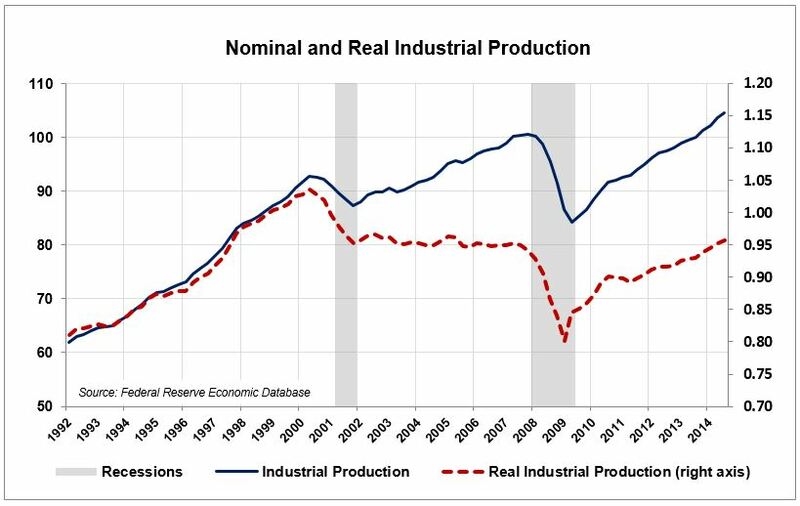 Industrial Production was the most heavily-weighted coincident indicator until a few years ago. The nominal series is trending upward, but the real series has grown more slowly than the rate of inflation. Although the trend in the nominal series is upward, the lackluster behavior of the real series leads to a ranking of zero. It is not consistent with robust, sustainable growth. The U.S. economy is on solid footing, and poised to extend its recent 3.0% real growth into early 2015. Part 3 of my 2015 Outlook will cover The Conference Board’s Leading Economic Indicators.